There are several dental conditions that weaken the teeth and make them vulnerable to infection and, in some cases, tooth loss. However, of all the complications that can impact the teeth, tooth decay is the most common. 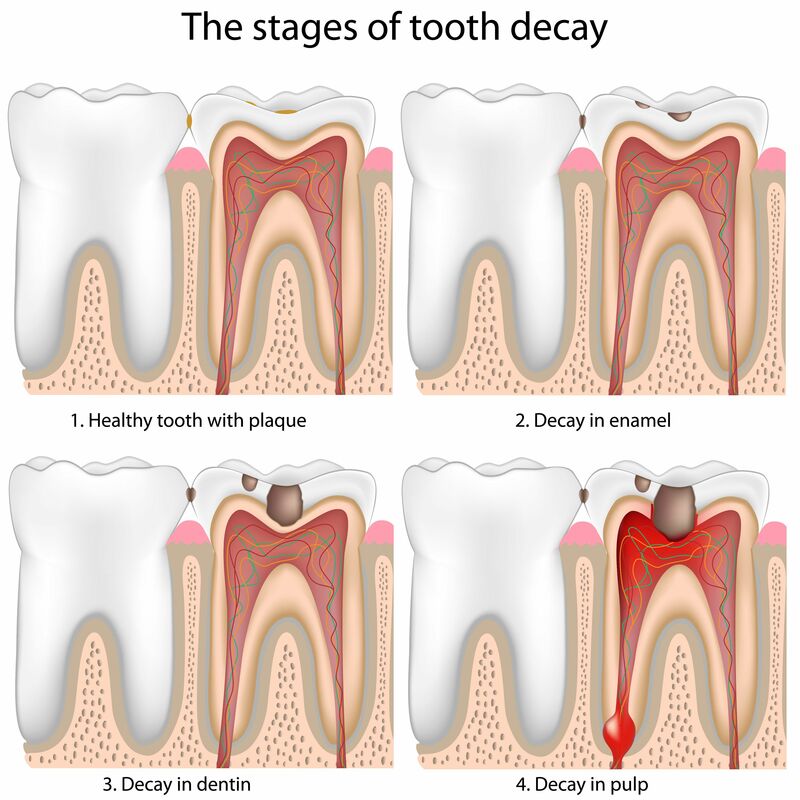 Nearly everyone will develop one of the stages of tooth decay at some point. Fortunately, there are restorative dentistry treatments to rebuild tooth structure that has been damaged by decay so that patients can, once again, enjoy a strong, healthy smile. At his dental practice, Dr. Byron W. Wall offers a full range of restorative services so he can provide treatment for all stages of tooth decay. Patients who are suffering from one of the stages of tooth decay should contact our Albuquerque, NM practice to learn more about our range of restorative dentistry treatments. Bacteria are the foundation for all stages of tooth decay. As dental bacteria thrive, they will combine with food particles and form a layer of plaque. A tooth with plaque buildup can be structurally sound and perfectly healthy. However, if plaque is left on the teeth for too long, it will begin to damage otherwise healthy tooth enamel. Although plaque buildup is not a form of tooth decay, per se, it is considered the first stage of tooth decay. To prevent plaque buildup from leading to tooth decay, patients should brush twice a day, floss daily, and schedule regular dental exams and cleanings at least twice a year. If plaque is not treated, tooth decay is inevitable. In its earliest stages, tooth decay will affect the outermost layer of the tooth, or the enamel. Plaque will wear away small areas of the enamel, causing holes in the surface of the tooth that are knowns as cavities. This early stage of tooth decay is best treated with a dental filling. Dental fillings are shaped and bonded directly to the damaged tooth. This treatment rebuilds tooth structure and restores a protective seal around the inner layers of the tooth. Dental cavities are pretty easy to treat, but if a patient neglects restorative dental care, decay will continue to progress. Once tooth enamel has become damaged, decay may reach the next layer of the tooth, the dentin. This moderate level of tooth decay may require more substantial treatment than a dental filling. Instead, patients may benefit from an inlay, onlay, or dental crown. All of these are indirect restorations that are fabricated in a dental lab before being bonded to the tooth. These treatments restore tooth structure and prevent further tooth decay and infection. The most advanced stage of tooth decay is that which reaches the pulp of the tooth. The tooth pulp consists of sensitive nerves and tissues. If bacteria reach these sensitive tissues, an infection is likely to form. A root canal infection threatens the health and structure of the tooth and can lead to tooth loss if it is not treated in a timely manner. Root canal therapy is the only effective treatment for root canal infection. This procedure eliminates damaged pulp, rids the tooth of bacteria, and restores oral strength. No matter what stage of tooth decay a patient may be suffering, Dr. Byron W. Wall can provide the necessary treatment to restore oral strength and health. To learn more about these dental services, contact us at your earliest convenience.